The exercise of forecasting and following, year after year, cycle 23 was interesting. I will try to keep this alive with cycle 24. I must say I had some trouble : the "syzigie" program still works fine, making me smile : "hey, this was my way of programming in 1990...". Great time of the Turbo Pascal. Unfortunately the "plots" program which allows me to plot the curves doesn't run any longer on my windows XP computer, and I have not kept the old computer. So... I made a shift to Excel to plot the curves, reading as a text file the veeaju.tmp file produced by the syzygie program. I still use the SIDC monthly indexes, available on line. It must be noted that the last monthly values are premiminary results which can be changed later. On the following diagram, I tried to plot what could be a trend on three centuries of solar cycles (blue dotted lines). 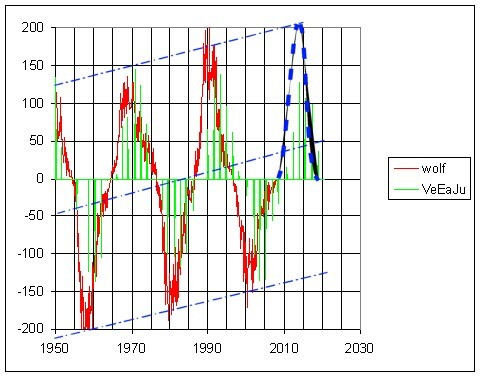 From the Maunder minimum, there seems to be a regular increase in the cycles amplitude as well as some sort of oscillation in the signed Wolf number values. There are a few accidents over or under this general trend. Examining the red curve (wolf number), it is obvious that an upward trend is present by the years 2000. I missed that in the cycle 23 amplitude prediction twelve years ago. Attempt of prediction (December 2007) : Could cycle 24 be of great amplitude ? If this trend is real and continues during cycle 24, we could have a strong amplitude for this one. See blue dots on the diagram.